I'm halfway tempted to forego writing a review of Alexander Korda's 1936 biography of Rembrandt and instead cut and paste my review of Bent Hamer's Charles Bukowski biopic Factotum [second review]. 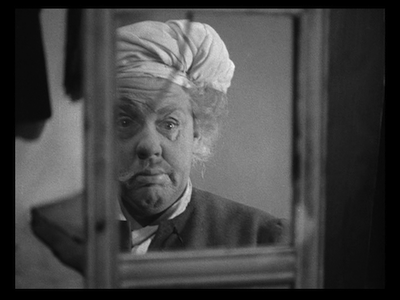 In Korda's hands, and as performed by Charles Laughton, the 17th-century Dutch painter is not dissimilar to the 20th-century poet. Both were passionate men with particular appetites, ahead of their time and underappreciated during it, and often too realistic in their manner of relating the seedier aspects of human existence. 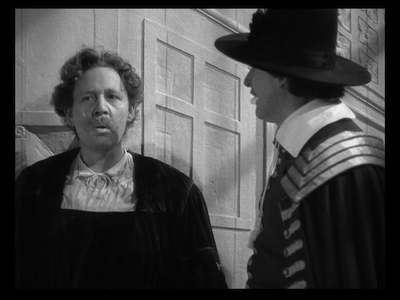 Laughton's Rembrandt is a bit of a bad boy, railing against authority, iconoclastic, an artist in every sense of the word. 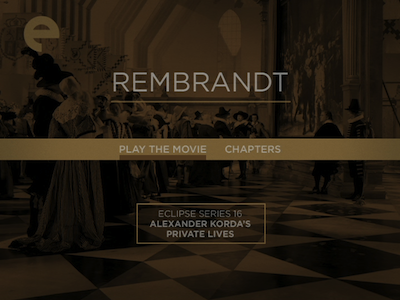 Rembrandt is the last movie in the Eclipse box Alexander Korda's Private Lives, and it's a good note to close on. It manages the right balance of seriousness and irreverence, building a convincing facsimile of history while also managing to allow for personality. The devil is in the details, to be sure, but Rembrandt is himself a devil, and there lies the joy of this picture. Carl Zuckmayer and June Head's script opens with a personal and professional failure. Though revered for his skills, Rembrandt has been avoiding taking paid commissions, preferring instead to paint his wife Saskia. The Civic Guard, a governing body of soldiers and politicians, ply Rembrandt with drink, money, and flattery, and so he takes on the job of a group portrait. It's ill timed, however; Saskia succumbs to a long-term illness. Worse, the painter's efforts to show the men as they are only brings disdain. The big commission--the now revered painting The Night Watch--is a failure. Fast forward several years, and Rembrandt is struggling. His home is now run by his opportunist housekeeper (Gertrude Lawrence), and his wife's final will ties up most of the family money with their son (John Bryning). Rembrandt feels lost, and only a visit to the farm where he grew up and a new romance with Hendrickje (Elsa Lanchester), a young maid who believes in him, revives his lust for life. The rest of Rembrandt shows their struggles, another rise and fall, ending with a final act that illustrates the despair of a wayward artistic life. The movie becomes a bit of a bummer in that last 15 minutes, but given the undulating pattern of Rembrandt's life, it makes sense. He was a man who loved deeply and who didn't recover from loss easily. Laughton digs into the role with his expected vigor, rendering both the artist's outgoing highs and his introspective shallows with equal insight. The actor had a special skill for understanding oversized personalities, and the extremes that came with them. 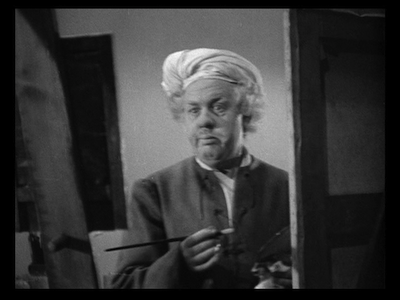 The summation of the painter's life in the last scenes could have had a mawkish gravitas if portrayed by a lesser performer; Laughton carries the weight with ease. 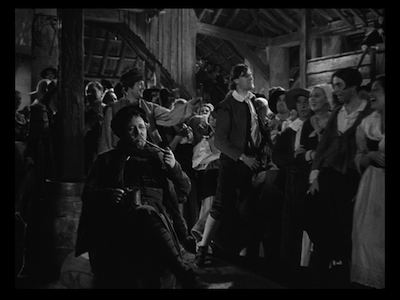 Korda's direction has certainly grown more confident since The Private Lives of Henry VIII [review], and he and Laughton have a clear rapport. They know how to work a scene together, when the actor needs to really go for it, and when he should hang back. There are lots of memorable scenes in Rembrandt--the dark pallor that hangs over his conflict with the Civic Guard, the tensely funny barroom brawl with the peasants in the artist's hometown, the sweet courtship of Hendrickje--scenes that fuse performance with material in a way that only cinema can. 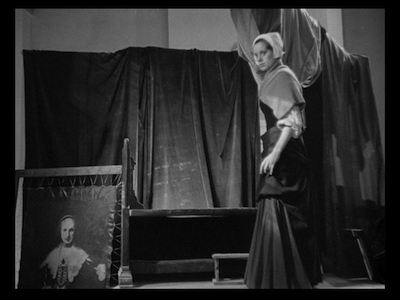 As per usual, the sets by Vincent Korda, who of course had Rembrandt's paintings to use as inspiration, create an essential component of the film, establishing an authentic world for the rest of the crew to lose themselves in. This makes Rembrandt the best of the historical pictures represented in Alexander Korda's Private Lives, in addition to being the last. It's a big finish in every sense of the phrase.